I photographed several small brown geckos active at night in Ghana, but I have only been able to identify one to the species level, Cnemaspis spinicollis. The others all appear to belong to Hemidactylus, but which Hemidactylus? This first one was near the base of a large tree trunk, relatively early in the night. It was particularly small, and I at first thought it must be a juvenile. That still might be true, but to my eyes it doesn't have the proportionally larger head that I would expect on a juvenile. Its body is more or less evenly covered with small pointy tubercles, which become longer pointier tubercles on the tail. 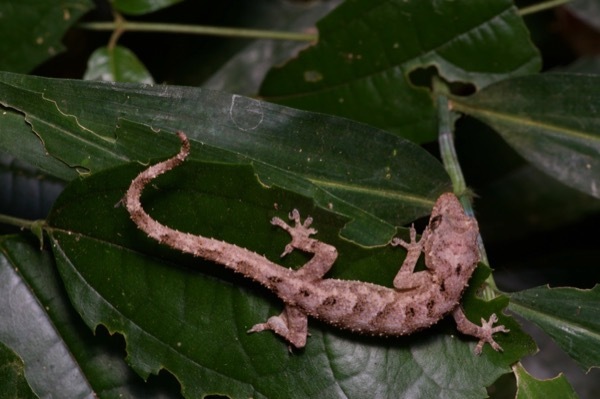 It seems to be the approximate size of and general shape of Lygodactylus, but those geckos are diurnal. Perhaps one was up past its bedtime? 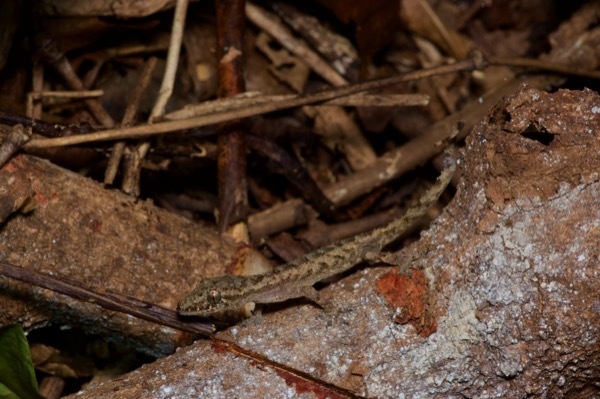 Dr. Adam Leaché did concur with my initial guess of Hemidactylus, but he only had one low-resolution photo to examine, and might have not been able to see the features that distinguish the two genera (and what exactly are those features, I ask?). These two were a little larger more of your standard small-Hemidactylus size. Dr. Leaché described the first as "Hemidactylus sp. (muriceus/pseudomuriceus or ansorgii? 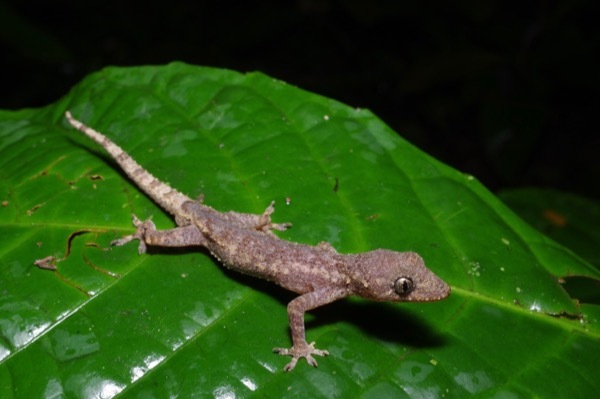 )", and the second as ""Hemidactylus sp. (muriceus/pseudomuriceus group)". 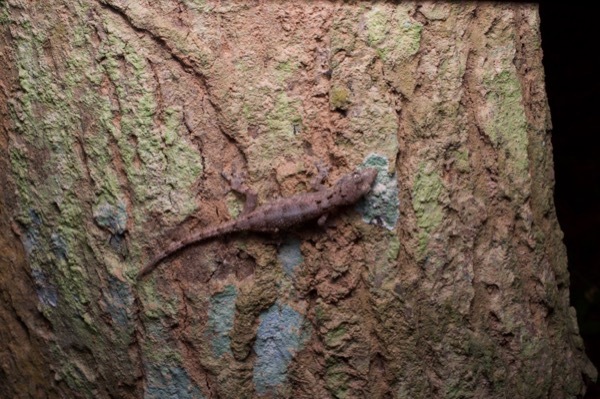 We got a very good look at this li'l guy in a different forest, but the results were equally uncertain. Dr. Leaché described it simply as "Hemidactylus sp." 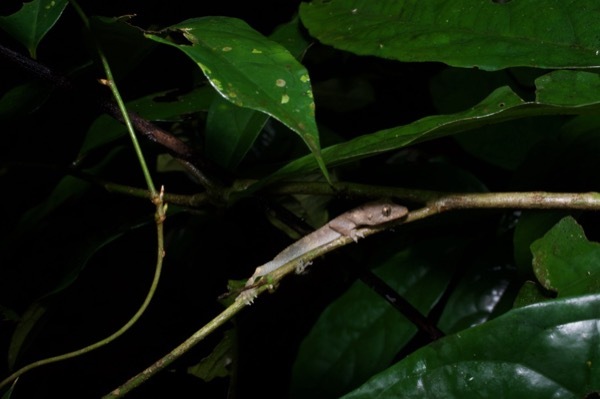 And one more from the next night, also described by Dr. Leaché as just "Hemidactylus sp."